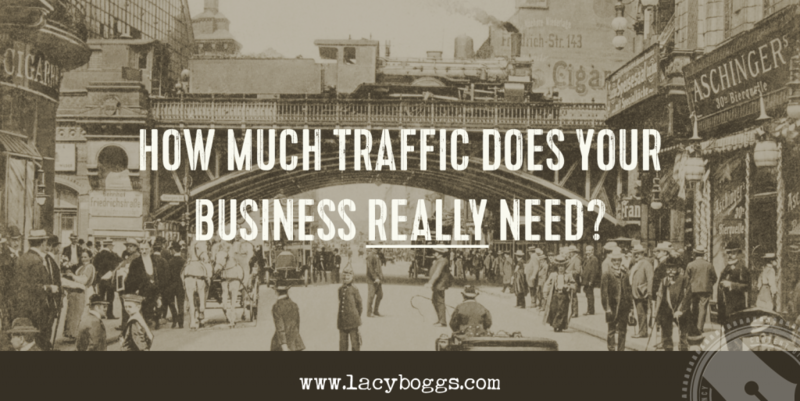 How Much Traffic Does Your Business REALLY Need? Over the last two weeks, I’ve had two calls with two different people — who have totally different business models — both of whom seemed to be looking for permission NOT to have an email list or do a lot of promotion/drive a lot of traffic to their websites. One needs to drive a lot of traffic, but doesn’t need an email list. The other doesn’t need a lot of traffic right now, but I recommended she start building an email list to use in the future. It’s a question of business model. How many sales do you need per month? That determines how much traffic your content strategy needs to generate. If you only need a few sales, because you have a high-priced offer, you don’t need a ton of traffic — and you don’t need a ton of people to join an email list. On the other hand, if you sell a lower priced offer, and therefore need to sell a higher volume, you do need more traffic. That means you also can’t possibly sell one on one to all those people, and so you probably do need an email list in order to use email to sell. And if you have a mismatch between how much traffic you’re generating and your business model… You’re going to have problems. Plus, what are you going to do with that traffic once it gets here? Our resident SEO expert wrote an excellent post on this as well — check it out here! Whether you need SEO — or an email list, or a Facebook account, or ads, etc. etc. — all comes down to your business model and how you plan to sell what you want to sell. That’s why we only create bespoke content strategies here. There is no cookie-cutter formula, no one-size-fits-all answer. What you do and what you sell are as unique as you are, and so you need a content and promotional strategy that supports your goals, your business model, and yes, your personality. If you’re interested in talking about what a bespoke marketing and promotion strategy would look like for your business, I would love to chat with you! Click here to learn more about our services and fill out a short questionnaire before we get on a call to talk about your specific needs and goals. So glad that we’re in sync about making sure that you get the RIGHT people on your site, and give them the RIGHT path to work with you! Enter your information below to join our email list + receive SHOCKING true stories of INCREDIBLE success. Enter your information below to join our email list and receive three SHOCKING true stories of REAL clients creating INCREDIBLE success through content. Join my email list and get SHOCKING Case Studies of INCREDIBLE success! Join my email list and get your MAGIC Content Spell for FREE. Join my list and get the MAGIC Content Spell — FREE! Use the fields below to join our list and receive the PDF in your email inbox. Join my list and get your FREE ebook: What Is Brand Voice? Join my list and get your free brand voice guidelines template — just enter your info below! Keep your blog LEGAL with this free checklist. Grab your free blog legal tips checklist — just enter your info below! Join our list and get your free Top Secret Recording Station Template — just enter your info below! Start growing your list today — join our list and get the FREE checklist. Grow your list with this 1 (+5) simple steps! Join our list and get your free Grow Your List Checklist — just enter your info below! Rock your next launch with this FREE checklist. Join our list and get your free Launch Content Checklist — just enter your info below! Launch your next big thing simply — join our list and get the FREE checklist. Ask these 5 questions for better content — join our list and get the FREE checklist. Improve every post with these questions. Join our list and get your free 5 Questions printable — just enter your info below! Create your 1st content upgrade with a checklist. Join our list and get your free Content Upgrade printable — just enter your info below! Start creating your own Content Upgrades — download the FREE checklist. Join my list and get your free influencer marketing spreadsheet — just enter your info below! Start your influencer research and outreach — download the spreadsheet. Join our list & receive your list of 201 blog post ideas for FREE! Join our list & receive your printable ultimate guide to blogging as a solopreneur! Join our list & receive your printable list of the 5 love languages of blog readers. 40 Places to Promote Your Blog. Join our list & receive your printable WRITING PROCESS worksheet. JOIN OUR EMAIL LIST & receive your printable CUSTOMER AWARENESS SPECTRUM worksheet. JOIN OUR EMAIL LIST & receive your printable step-by-step CONTENT TO PRODUCT worksheet. JOIN MY EMAIL LIST & receive your step-by-step worksheet to determine your Cornerstone Content Topic. JOIN OUR LIST & receive your printable step-by-step social media content curation worksheet. JOIN OUR EMAIL LIST & receive your printable step-by-step THINK SIDEWAYS worksheet. JOIN OUR EMAIL LIST & receive your printable eBook. editorial calendar template and video. and receive our Blog Content Audit worksheet FREE. MAGIC Content Spell Worksheet for FREE! and receive your FREE Codebook Template! Join our email list to receive the Brand Voice ebook — FREE. and receive your FREE Recording Station. and grab your free Launch Content Checklist. and receive your 5 Questions Worksheet for FREE! and receive your Content Upgrade Checklist for FREE! and start your Influencer Marketing research now! and receive your How to Write A Blog Post worksheet FREE. UPGRADE YOUR ACCESS LEVEL to join our list & receive access to dozens of valuable free resources. DON'T WANT TO MISS ANY UPCOMING BLOG POSTS? Join our email list and get them delivered straight to your inbox every week... it's free!